Well, Christmas is over, New Year is about to come. Al the tins of chocolates have been scoffed and the new year still has yet to make an appearance. The Christmas lights go off soon, leaving long nights without much cheer. Here at the Mostly About Chocolate blog we’re all about bringing happiness and excitement to people’s lives and that’s why we’re giving away ALL THIS CHOCOLATE! Yep, that’s right, I’m paying the postage and sending this anywhere in the UK the winner happens to be (sorry international folk, the postage costs me more than the chocolate is worth!) and I will draw the winner the day after Twelfth Night! So between now and January 5 make sure to enter the competition with a comment (as per instructions below) and once done you can tweet and follow the blog on Facebook. 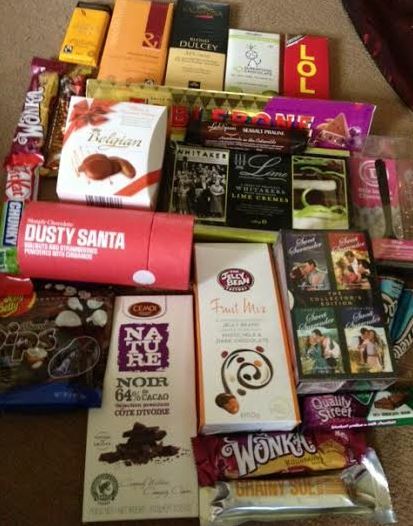 Raffle Copter handles all the details so I hope you’ll indulge in entering this competition for all the pictured chocolate and more! Leave a comment of MORE THAN 10 WORDS about the funniest memory you have from 2013. I will read them all and the comment will influence the winner. Tweet that you entered! You can tweet only once a day but that gives you a few opportunities! Like Mostly About Chocolate on Facebook – RaffleCopter can tell and give you the entry easily. 1.The competition will finish Sunday 5th January 2013 when RaffleCopter closes it. 8.You have 8 days to respond to my email after which point I will choose someone else to win. Sitting in the Drs waiting room with my little boy he dropped a book he was playing with, I reached down to get it causing the leather seat to creak – at this my son announces rather loudly “MUMMY FARTED”, I wanted the ground to swallow me up! My daughter asked the doctor: do black people have black bones? the funniest thing that happened in 2013 was at Christmas when my Mum passed a present to me & said you can take the top back if it dosen’t fit. Now that does not sound funny at all when writing it, but it was one of those you had to be there moments! The funniest thing of 2013 was my little 2 year old Granddaughters reaction to being told the burglar alarm sensors were Santas way of watching to see if she was being good, & every time they went red he was looking to see what she was doing. Her behaviour was wonderful, and she kept waving, smiling & saying sorry Santa if she did anything a little naughty. Result!! My funniest moment of 2013 was my partner asking for a ‘6 foot’ sub at Subway. I’ve never laughed so much! Funniest thing was when I saw an advert with Jean Claude van Damme where he was doing the splits between 2 lorries. I seriously couldn’t stop laughing after I saw it! there’s not a specific memory – however whenever I go out with a certain group of friends there is always lots of laughter. Nothing really stand out funny for me, but a pretty good year all round I would say! I can’t remember anything specific but my two children always have me in fits of laughter, even if they don’t mean to. Every day is funny since we got of rescue dog a few months ago. When one of my kids fell over carrying a try of paints, they looked like a rainbow sitting on the floor. Oh for a camera! It has to be on holidays when there was no where to put a rubbish bag and my father happens to fall over the bag and cut is foot on the corned beef tin. It was funny afterwards with the way he hoped back to the chair. Watching one of our pet cats use his scratching post as a pole dancers pole. Pity we did not video it as it was hilarious! The funniest memory I have is of watching our then tiny puppy spending ages trying to carry a three foot long cardboard tube through the doorway. When we eventually helped her, she was so happy and waggy and wiggly, we were all in stitches. My daughter reared an orphan chick and it liked to sit on her shoulder and comb her hair with its beak. Later in the year when it was established in the main chicken pen and fully grown, my daughter visited after an absence and straight away this fully grown chicken flew up to sit on her shoulder to comb her hair! Every time she went out in the garden! It was so funny! I bombarded my friend’s facebook page with Wonga loan adverts.He got so fed up he unfriended me. My funniest moment of 2013 was having a day off of work and finding the joys of youtube videos – hours of constant laughter – laughing babies, talking dogs, funny cats.. what mroe could I ask for! my fumiest memory of 2013 is having No funny memories at all! Tough to think of anything in particular but always good fun at tennis tournaments with odd moments that are entertaining! Funniest thing was when my son started school, when i picked him up he thought id left him. It took him at least a month to realise it was supposed enjoy it. The Argos blue alien ads, got to be the best ads ever. When we had to a trip to a theme park and got lost and was driving around for hours, we can laugh now! watching my brother doing his wedding dance! Now known as the ‘lead shoe shuffle’. Poor guy spent weeks at dance lessons with his bride who is a fabulous dancer whilst he is not! Not sure if it was the funniest moment, but I sure smiled a lot. Sitting on the train home on my last day at work just before Christmas – I COULD NOT wipe the smile of my face. At the zoo. I was walking through the lemur enclosure not realising there were big birds roaming free..
My mum is going deaf, probably not a nice thing to say but the things she thinks I said is so funny. Best unheard one has got to be. Mum do you want a cup of tea? Do I want to have a pee, why the hell are you asking me that if I need the toilet I can go myself! The funniest moment and it’s one which will stay with us and continue to make us all smile for years to come was to do with the prize recently won by my wife in a local raffle. We have 6 children (the youngest 5 and the eldest 19) and can count on one hand the number of times we have gone out other than for work on our own over the years. Also I should also point out that although we had entered many we had never previously won a competition or raffle prize. Our 4 teenage children were attending an event where a raffle my wife had entered was being drawn so naturally when my wife’s ticket came out first they were asked to choose the prize on behalf of my wife. News reached my wife that she had won 1st prize in the raffle and we sat together in eager anticipation awaiting the kids return wondering which of the top prizes the kids would have chosen. My wife raced to the door to greet the kids on their return home. Had they chosen the overnight stay in a luxury hotel, or the 3 course meal for 2 at a top restaurant, the case of wine or the spa day? It was when a snowman soft toy was handed to her that I realised what a great actress my wife of 20 years and mum to our 6 children must be, telling the kids what a great choice they had made. Later we learned that although the raffle organisers tried to get the kids to take one of the higher value prizes they insisted on the soft toy their rationale being that Mum & Dad never go out and don’t drink that much. After sharing a good laugh, after the children went to bed we concluded that should we ever win anything again it would probably be best to choose the prize ourselves. Meanwhile we smile at each other every time we look at the snowman and suspect we always will. My daughter and I visited a local farm and got to hold a chicken, I was so terrified that I let it flap away but it got into the face of the lady next to us who started screaming hysterically, I wanted the ground to swallow me up but laughed for days afterwards! Watching my 6 month old daughter trying to lift the cuddly bunny doorstop from her bedroom floor and not understanding why she couldn’t and why it was so heavy! My funniest memory was on Christmas Day when Dad managed to make one of his sprouts fly off his plate. Everyone was in fits of laughter. It was from just a few days ago when we were tobogganing in Switzerland and seeing my husband totally wipe out in front of me. He was fine and we all couldn’t stop laughing!! racing to get to the maternity hospital for the birth of our Grandson, over 150 mile trip, sat nav took us to the back of the hospitalswhere the bins were stored! not funny at the time but mad us smile since. At our oldest sons wedding they were being photographed signing the register with their 2yr old on his lap. Grandson picked up the pen and scribbled on the register. My funniest moment was when updating to Windows 8.1 from 7, the ssd failed and the IT manager had to restart again. After buying loads of toys for my cats, seeing them rolling around inside a cardboard box, having the time of their lives. I have lots of funny memories of my children saying funny things ! I cant think of a specific one just now but most days they do funny things! On a cruise holiday in the Baltic in August: our ship nearly mowed down a little tourist ship because it wouldn’t get out of the way! Sounds dodgy but seriously looked hilarious, everyone on deck was chuckling! My boys running into my bedroom on Xmas morning wearing reindeer antlers and the younger boy shouted out ‘ look mum we’re chickens’! Cruel but funny – out visiting his Mum, my hubby banged his head twice in one day. Once on a low beam at the hotel. My hubby is rather tall. Then on the same afternoon coming around a corner he banged it off an open garage door! I know you shouldn’t but I couldn’t stop laughing … if I will I will let him have first pick! My funniest memory of 2012 was our school production of The Sound of Music. The reception class were dressed up as puppets for The Lonely Goatherd song and we had a mixture of exuberant puppets, nose picking puppets, sleepy puppets and ‘waving to mummy’ puppets! Very funny! When I went outside to put some rubbish into the dustbin I stood inside the bin to squash the rubbish down for more room when suddenly the bin toppled over with me inside and I ended up rolling in the bin with just my legs sticking out. My husband complaining there was no meat on the turkey. He was carving it upside down! My sister fell down all the stairs becuase she was being too lazy to walk down them properly! Best moment of the year hahahahahahahahaha! I told her if she didn’t do it by the time I counted to 3 she would not get a biscuit with her bedtime milk, to which she replied “Mummy, don’t mess with the dress!” I was laughing too much to be cross with her. When I asked her where she had heard that, she said Barbie says it in the Three Musketeers. And I thought Barbie was supposed to be perfect! My funniest moment was walking into my living room and seeing my brother and youngest son, tops off dancing to gangnam style, haven’t laughed so much in a very long time. Out on a walk with my two dogs, one of them bolled me over , I wnet flying and I had a skirt on and everyone got a view. Well, I was lucky enough to visit New York City in June 2013. It was beautiful, hot and very different to the UK. The day before we were due to fly home, we decided to visit the Empire State Building. Taxis were a nightmare to flag down, so we decided to walk. Imagine, 30*c so we were dressed in light clothing! next thing it starts to rain heavily. Ten minutes into our walk we were absolutely soaked to the skin, then the sun came out. Literally minutes later we were none dry again. Now, we eventually get to the Empire State Building, go through security and head to the top. There I am posing for a picture, and just as my dad presses the shutter, an opportunistic pigeon decides to poop on me! I was left more than refaced and have the pictures to prove it! Your collage of wrappers looks just like my book cover! Have you read Chocolatour yet? Dying to hear your reaction. Happy New Year to you, Judith! Hope to see you again soon. My youngest Harry (he was 3 at time), went swimming with me and he accidentally swallowed some of the water – he pulled his face and went “yuck, needs blackcurrant. Can they put some Ribena in here mummy? It will taste nicer and we can be like Barney” The thought of swimming in Ribena and everyone coming out purple like Barney the dinosaur – I couldn’t stop laughing! Trying (and failing) to catch hold of one of our pet chickens who was making an escape bid – as all our neighbours watched on over the garden fence! My mother-in-law telling us she fancied a Pagoda in her back garden – she meant a pergola for her climbing roses to grow on! Going on holiday with my mum we decided to stay in a lodge with a hot tub. One night we were in the hot tub and the neighbours dog came bounding up to see me, I made a fuss of him and then he went off on his way. About 10 minutes later I had moved over the other side of the hot tub when the dog came back and because he couldn’t reach me he jumped in, water went splashing all over, it was so funny but the neighbour wasn’t too pleased when his wet dog went flying into back into his lodge and shook his wet fur all over!! Funniest moment was telling my daughter a wasp flew up her skirt in the garden, she ran round screaming stripping off as she went !!!! I can’t say that I have a funniest moment of 2013. there hasn’t been much to laugh at! He came up the stairs anyway so I flicked the switch and blew him back down the stairs again. This was about the 10th time in a row that I’d killed this player, and every single time he fell for it, whether it was a ‘I wouldn’t climb up that ladder if I were you’ or ‘I wouldn’t drive down that road if I were you’ etc., each time I was able to set off the relevant booby trap or get an easy sniper shot. So by the 10th time I was crying with laughter. I cannot recall anything really funny happening in real life in 2013. Lots of laughs from things that I read online, but nothing happened to me that springs to mind. We went ice-skating yesterday and we laughed so hard everytime one of us fell over. It was fun! Managing to fall flat on my face whilst on holiday – stone cold sober! I think the funniest moment for everyone else was my most embarrassing moment when I accidently called my partner ‘mum’ in front of all my work colleagues. They still haven’t stopped laughing about it. My cat getting stuck up at the top of the christmas tree! More funny now than it was at the time! I know it is cruel to laugh, but my OH insisted on lying down whilst out on a walk in the Highlands to get a better photo and he got bitten by an adder! Luckily his jacket protected him from the worse but he had an aching arm for a week or so and all he got from me and our friends was teasing about his photography. My mother in law phoning AOL to tell them that her radio was not working, she meant WIRELESS network. Or maybe the time she thought buying a memory foam pillow would improve her memory!!! My funniest time was probably just after my daughter was born! hearing the stories from my husband and mam about what I was saying during labour and having flashacks! soo funny! Watching my Retriever puppy chew a Tangfastic and spit it out in disgust! watching my husbands false tooth fall out when he was talking to his mother-in-law! My niece and nephew are always doing impressions of me and always making me laugh. Me and another neighbour had the task of looking after the people opposite’s chickens. Collecting eggs was okay, but having to put them into the coop at night was another matter. The cockerel was very aggressive and took exception to us, I can still remember the sight of him chasing my neighbour around the garden. She did get bitten on the leg so perhaps I shouldn’t have laughed so much! The funniest moment was when my husband had caught a fish that he had been after for a while, however, when he was trying to reel it in, a barge went past and took his other rod! he had to put the fish back and run down the bank to get his rod back! Watching Mrs Brown’s Boys on TV with the family. We all love the show and find it so funny. Mum now requests we show if again :- Thanks to On Demand. I have a terrible memory, but the funniest recent thing that has happened was recently on New Years eve!! I gave my 21 month old a tiny slice of chocolate cake and she started drooling on it – sooo funny!!! My funniest most recent memory is saying something about my son to my sister in law at the table on Christmas Eve and making her laugh so much she spat her food out all over my brother – his face was priceless! Whenever my 1 year old tickes my feet it makes me laugh every time! My funniest memory of 2013 was when my partner took the dog for a walk late one evening and when he returned both he and the dog were unrecognisable. They were both covered head to toe in mud because my partner fell into a 4 foot puddle. Its fair to say the dog thought it looked like great fun, so jumped on top of his head. I just wish I had witnessed it myself! I don’t have one specific thing my 1 year old has me in stitches every day! My partner rushing us up to town to catch a train and finding we were over an hour early – went to Wetherspoons and had lunch. Has to be on our holiday in spain when i tried to convince my kids and my mum and my hubby to go in the haunted house ride, my boys and hubby didnt want to, so i convinced my mum..OMG…. guess who had to be escorted out as she was in tears of freight….YES ME!! (im 38 yrs) Then every time i walked passed the ride the people dressed up were trying to scare me ..and were laughing at me…so funny!! The people on the trip decided to play tug of war. He ran towards the men tugging. He never did join in the tug of war as he was struggling to get up. our funniest moment has to be when i told our 10 year old it was not as bad for you if you ate broken biscuits instead of whole ones cause all the calories fall out the broken ones, he then went to school and informed all his friends and teachers of this, it was pretty funny at the time. At V Fest this year my mates and I had a BBQ, one of those disposable ones. It smoked and smoked, we didn’t think there were any flames, but suddenly they took off and the BBQ was too close to one of the tents, it set alight. I found it highly amusing – well it wasn’t mine – not sure the other guys did!! We were on holiday visiting a maze. We raced the kids to the middle and wondered how they had got there first. Little did we know they were sliding under the hedges! My funniest memory is my little boy coming out with funny sayings and pretending to be a monster and making us all laugh all the time. Seeing my children wandering around the house in monster onesies. when out shopping seeing a man trip and then act like it never happened. My friend Sue, walking around my living room, roaring and doing a very funny impersonation of a Tyranasourus Rex, to show us what her son insisted on walking like when he went through his fascination with Dinosaurs stage. She looked soooo funny…tiny hands and bottom stuck out…and usually she is so quiet. My son fell down the toilet while doing a wee. my son asking me in the middle of Tesco if its time i had another baby and he is really bored! My funniest memory may seem quite banal but made me laugh. ( probably one of those you had to see it). My partner was trying to change a bulb in the office. I heard a whimpering voice shouting my name and walked in to see him on his office chair spinning round and round. He was unable to stop and had his arms out stretched to try and slow himself. I was in Hamley’s a couple of month’s ago with my son and little granddaughter, my son picked this laughing, vibrating really weird alien type toy up, called a Gigglez and handed it to my granddaughter who literally threw it, in shock, I think, and nearly fell backwards, it wasn’t nice that it had frightened her, but I was in stitches in the middle of the shop and just had to buy it, the strangest toy I have ever come across, but boy, it really made my day, little things please little minds maybe! Doing watersports in marmaris with my best mate..:D we were in a big round bouncy thing that was dragged along at full pelt over waves.. we went flying into the air one of the times and my friends legs came flying up and she kneed herself in the face chipping her tooth.. sounds awful but we laughed so much that we almost peed ourselves.. .. all the time one of the speedboat drivers had been taking pictures and looking over them afterwards we laughed so hard i nearly broke my ribs.. awesome times! My funniest moment for 2013 is the most recent one of playing a game of chilli chocolate roulette with my hubby and 2 teens. There were 11 nice chocolates and one filled with chilli so I said that I would go first as my reasoning was that I would have to be pretty unlucky to get the one bad out of all those nice ones! I was very unlucky and I did get the chilli one on my first go and oh my was that hot. The even funnier thing was that my hubby and teens were not sure if they could believe that I had got the chilli one on my first go so for the rest of the game they were still really nervous thinking that there could still be a chilli chocolate there! Going Aqua Zorbing on the hottest day of the year wearing white clothes and everything went see through – underwear inclusive… it wasnt funny at the time though! My funniest (if not a little cringe-worthy) moment of 2013 was when my little boy (age 3) was asked to say a little something on a microphone at my partner’s uncles wedding. Both the bride and groom in their late 60’s…and my little boy pipes up with “Do you have a bath together like mummy and daddy do?” It was the talk of the night and my little boy was rather pleased with himself when everyone started laughing. My funniest memory is when my Fiance fell off our computer chair and broke it,my 2year old daughter ran up to him and said haha whilst laughing at him.She was laughing so much at her dad while he was on the floor! My funniest memory has to be on Aprils fools my dad swapped mums false teeth that were soaking overnight for his and mum panicking the next morning because her teeth wouldn’t fit. (my parents are in their 70s and still prank each other all the time!) Mind you with all this chocolate I think I would be the one needing false teeth. Having a snowball fight last winter with half my street it made us all laugh and get to know each other better. Waking up to discover my niece had covered herself from head to foot in Sudocrem, and the walls, and the carpet! She was certainly tricky to catch as she was so slippery! It certainly took us more than one day to clean up the mess! son saying ‘my mums alawys naked’ at parents evening! In 2013 I rescued a Westie called Bertie, when I first met him he was barking, snarling and filthy, I took him home on a trial basis, when he came in with Ruby our other westie, they both started licking each others noses, it was adorable but funny as I thought we were going to have trouble. Funnily enough he never left and is a true gift. I went to an Ann Summers party and had to get into some very funny positions with me and a girlpal..and we had to pop balloons between our bodies, thank goodness nobody took any photos, we were laughing so much we were crying! Just before Christmas I was sat with my 2nd youngest son Samson (6) and an advert came on about the poor children in Africa, with it mainly saying they have no water and could we help get them water…. Samson was taking it all in and he said to me, mummy! they need our water how can we get it to them? will the hosepipe reach? and THEN he thought a bit more and said if we all give them our water – what will we do for water? that means we will die…. will someone put us on the telly then? whos water will we be able to have??? bless him… talk about over thinking! ha!!! The funniest moment for me was when I was Christmas shopping on line and said ‘oh dear’ to my 2 year old little girl. She asked what was wrong and when I told her I had spent too many pennies, she replied ‘Don’t worry, it was an accident’. Watching my granddog fall into the river and have to swim back to shore. The river had flooded and the poor dog thought he was paddling on the shore when he inadvertently slipped over the edge. Hew was fine though as he is a Labrador and a very strong swimmer! At a christmas party my son dressed in a tuxedo and dancing bent over and split his pants ,the look on his face was so funny everyone was laughing. My funniest moment happened over Christmas. My mum has a Christmas stocking with a reindeer on that dances and sings when you press a button- one evening one of the cats set it off my accident, the look on the cats face as she tried to stare the thing down was absolutely hilarious! She won’t sit anywhere near the reindeer stocking now. My funniest memory was taking my nephew swimming with my friend and I, he’s only 4 and the pool was a leisure pool so had lots of play things, including a giant bucket that filled with water and tipped every ten minutes. Every time the siren went off, my 28 year old friend and 4 year old nephew would squeal “the bucket! the bucket!” and run through the water to where it tipped to make sure it dumped water on them. When my cat tried to jump on the dining room table (despite knowing she shouldn’t). She landed on a small pile of magazines, most of which were only half on the table. As soon as she landed on them she slipped and she – and they – went crashing to the floor. She was so scared she ran out through the dining room and kitchen, and out the cat flap before the last magazine had hit the floor. One of my students drawings of the Of Mice and Men quote “Rabbits came out of the brush at night.” Yes, she drew a rabbit next to a sweeping brush. Funniest memory…my daughter falling out of bed-without fail, at least 4 times a week-and she’s 4!! Just very clumsy and moves around A LOT!! After a night out in America, we returned to the hotel and as we were getting into the lift, Blurred lines was playing on the radio. My dad was doing a silly dance backwards into the lift, without noticing there was someone already in there, who didn’t look amused at all. We were laughing our heads off in the lift, it was hilarious due to my dad not realising someone was in there, the man didn’t even find it at all funny. I had a party at the beginning of the year to celebrate my 50th Birthday and my eldest son’s 21st…….It was the best party I have ever been to! Next time I have a joint celebration party I will be 60 and my youngest son will be 30! Such fun!! My funniest memory hmmm this is not easy as i have a fair few I think it has to be last summer as i can’t think about it without laughing. we owned a canvas tent from the 70’s and went away in it every year ,my son decided to ask his friend who had never camped before to come along we were having a great time rope swings giggling at my cremated potatoes on the fire then the boys went to bed ,me n hubby sat around the fire drinking and chatting and were ready to go in when a rain cloud hit and the whole tent was leaking my son’s friend woke up and i wrapped his legs in bin bags and masking taped bin bags over every thing ,all you could see was me and a flash light cracking up and laughter bellowing across the field . Even though it was wet this was the funnest night camping ever . Every Saturday when we go out dancing with a group of friends. We always have a great laugh. On New Years Eve we were dancing to a live band and the lead singer was playing the fool and dancing like a teletubby.. the funniest thing was the bass players face ! He is normally so straight faced but his jaw just dropped and we were in hysterics ! The funniest thing is, absolutely nothing funny happened to me last year. It was truthfully the worst year of my life but if you don’t laugh you just cry! my most embarrising moment was when walking round asda and my son pointed the a rather large lady and shouted look at the bum on that dad would you? Hmmm, hard to say… probably my mate getting pooed on by a pigeon and having to wash his head in Yates’ toilets! Not had too many funny moments in 2013, but my funniest was probably falling down the back of the sofa and just hanging there begging to be pulled back up, while everyone around me laughed their heads off.. turns out giggling is contagious. My son got this weird rash all over him and I gave him some antihistamines for it then I proceeded to say “Who would have thought about giving antihistamines for a rash?” It was a silly comment and my mum and I fell about with laughter at my stupidity! it doesn’t really sound that funny but it was at the time and sorry if it offends anyone. i am a sexual health student and training to be a sexual health adviser, at uni we are required to do varied amount of assessments, one of mine was to do a condom demonstration. just to my luck the condom split during this demonstration d but i was infront of 30 15 year olds including my step sister. it was fair a red cheeked moment, my sister just burst into fits of giggles as did the rest of the class, it was truly embarssing but so funny as i was just stood there with a condom in my hands. its ok, i still passed. I really can’t think of any particularly funny memory from last year, although looking after my daughters pet ratties while she was on holiday made me smile a lot. Such gorgeous, entertaining little creatures with huge personalities. my funniest memory of 2013 was when I accidentally left an open tub of Sudocrem in my grandsons travel cot after changing him. I walked in to find the large pot of nappy cream sitting between his legs, with him covered from head to foot in it and a look as if to say – it wasn’t me LOL, he was just over a year old. When my sister was telling me all about her neighbours trampoline flying away, I could not breathe for laughing! One very funny moment was when I was in my first couple of weeks training at work and a girl I was training with couldnt pronounce a word and got it completely wrong. Both of us were in stitches of laughter in this training room with everyone else being serious. One of those moments where you cant stop laughing and the slight thing sets you off again! Turning up at the wrong party as I had the date completely wrong -was a funny night after that! My funniest memory of 2013 is ironically planning to see a Hypnotherapist to cure me of my addiction to chocolate, and now look at me here! My other half recently fell over the recycling box. He seemed to do it in slow motion and then spent 10 minutes on the floor telling me he couldn’t move. I could hardly breath for trying not to laugh. I dropped my bag down the toilet in a public toilet just as I flushed it. I laughed and laughed so much. I didn’t know what to do. After I calmed down I had to dry everything out. My son ‘whispering’ loudly to Santa, whilst paying him a visit, that he has been very good and whatever Mammy and Daddy has told him is all lies, and because it’s naughty to tell lies, he shouldn’t bring us any presents! My husband and I couldn’t move for laughing, the poor ‘elf’ couldn’t hide her face quick enough. My funniest moment was when I accidentally tidied the stepladder away and left my husband stranded in the loft for 20 minutes! My 20 month granddaughter and I accidentally bumped heads in the swimming changing room and she said ‘sorry darling!’ It had me in stitches for hours. My Grandad trying to push my 4 month old brother down a hill instead of around the path ! i have a fair few funny memories from last year, mainly because i have 4 very funny children, but the funniest thing was when my daughter came home from school one day and asked me ‘mummy, what animal lays a sausage’ never laughed so much lol! My funniest memory of 2014 is when my cat fell into the bath whilst we were running it and she came out soaked! Then, we had to dry her with a hair drier and she actually enjoyed it!! Mine’s funny/embarrassing but I went on a very early morning coach excursion on holiday and fell asleep. When I woke i’d twisted in my sleep and managed to rip my shorts open completely showing everyone my bright pink pants! Thankfully a sweet little old lady leant me her scarf to cover my dignity! Funny in hindsight, embarrassing at the time! My funniest memory is when we were on holiday and someone thought my friend was a film star! My youngest dog loves to watch TV, visitors are always amazed at how besotted she is with it. She watched the whole of the Olympics Opening Ceremony and started whining if we tried to switch channels! I went to Blackpool for the day with my 3 year old, my mum and my grandma, as it was a nice day we decided to have dinner on the beach although we weren’t really dressed for it ( ie not wearing shorts or swimming costumes ) we all warned my son about running on the beach as he is a bit accident prone, but the inevitable happened, he tripped and went head first into a rock pool and drenched himself! I had to rush off quickly to buy a cheap towel and clothes from one of the shops! Last year my dad and I went christmas food shopping at Sainsburys, it was possibly the Saturday before Christmas so it was absolutely hectic with everybody rushing around. Our trolley had over £75 worth of food in, and we turned our backs on the trolley for no longer than 30 seconds and then to our surprise it had disappeared!!!! My youngest is autistic and constantly has me in stitches as he takes everything so literally! On a visit to town I said we’d go and see his Nanna (who lives in town) and “Kill two birds with one stone”, spent the rest of the day explaining I hadn’t actually killed any birds or thrown stones at them! My daughter on the train home on her birthday from Peppa Pig World (She’s two!) seeing an attractive man getting on the train, she shouted “WOAH! WOAH!” and tried to follow him. Killed myself laughing! Probably this Christmas when my 6 year old niece said she wasn’t going to get married as she was going to have 100 cats instead. When I had just spent ages cooking dinner, dished it up and gave my Daughter her plate. She didn’t quite get hold of it and it went up in the air, over her shoulder and plopped on the kitchen floor. Her expression was priceless. I think she expected me to shout and scream but I just burst out laughing. What can you say she didn’t mean to do it. I still rib her and say well if you didn’t fancy that for dinner why didn’t you just say and I would have cooked you something else. My little boy crawling around the table chasing his daddy! My 7 year old niece instead of making a list for Santa decided she was going to make an order. Her older sister made a list though! Had us in stitches. My funniest memory… would have to be my friend’s hen party. She was Cruella de Vile. I was Bubbles from Ab Fab. It was a murder mystery and we had to act out a story. Watching people get into their characters was hilarious! falling face down at the edge of the sea when trying to get out infront of a whole beach full of people. Ended up having to go back in the sea to try and get rid of the sand out of my bikini! My funniest moment, though not the least painful, was when I fell over a pile of boxes I was about to take to the charity shop. I completely forgot they were there, thank goodness no one saw me as it was very Frank Spencer. The worst part was the black eye, which rather than telling everyone how I done it and sounding completely foolish I made up the story that I’d done it ice skating which was slightly more exotic.